I was just passing by my local bookstore the other day and FAQs on Marketing caught my eye. I recognized the name of the author (Philip Kotler) immediately because I used to study his books on marketing when I was in college. As you might have expected, I bought the book shortly after browsing through the content. As a broad overview, FAQs on Marketing covers Kotler's views on Markets and Marketing (Trends, New Ideas, Major Challenges), Marketing Strategy (Segmentation, Targeting, Positioning, Differentiation, Innovation), Marketing Tools (the 4Ps, Advertising, PR, Sales Promotion, Management and Selling, Sponsorships, Buzz Marketing, Media), Marketing Planning, Marketing Organization, Marketing Control, Marketing Areas of Application (Retail Marketing, Direct Marketing, Internet Marketing, Personal Marketing) and Marketing Excellence. Kotler covers more breadth than depth in this book. 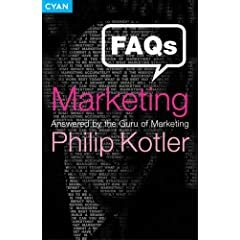 What I found most interesting wasn't so much the actual bulk of the content itself but the way Kotler carried out his up-selling, cross-selling and personal marketing when answering the frequently asked questions. He constantly referenced many of his other books and papers and established himself as an authority, who helped pioneer many of the marketing ideas and concepts we know today. Too much of today's marketing is 1P marketing. Companies mainly concentrate on promotion and sales and disregard product, price and place (distribution). This results in ineffective marketing. With the advent of the internet, customers are able to compare prices easily and this has raised the importance of pricing among the 4Ps. That being said, branding is still crucial. Customers will not necessarily go for the cheapest brand. However, they are more than likely to buy their preferred brand from the retailer offering the lowest price. Respected Sir, I am a proud ‘Philip Kotler’lover’ with a lot of respect and value. As a marketinging student (and now a marketing teacher), I consider Philip Kotler as my guru and solve almost all my marketing teaching problems from your books. One thing which is confusing, is the ‘Brand’ defined by you as a ‘product’. Would you allow me to call the Brand as “personification of a Product” instead of a product. You will agree with me that a product is manufactured and a brand is created. The product discontinues and the brand continues. A company may have a products mix to the tune of 2.4 million+ and just one Brand. I have developed my own Brand model. It is my keen desire to share my views and efforts with your honour and seek your valuable comments and guidance.